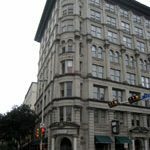 Real estate investment firm Harris Bay is under contract to buy the Commerce Building in downtown San Antonio and move its Texas office there, the firm announced Wednesday. Though the sale price was not disclosed, Bexar County’s latest appraisal of the 40,000 square foot, eight-story building at 314 E. Commerce St. was $2.875 million. Harris Bay, which has offices outside of Sacramento, California, and at 51 Essex St. in San Antonio, will also lease out office space at its new address and is considering making the space mixed-use by turning the top floor into residential space. One project under development by Harris Bay is Essex Modern City. The mixed-use community just east of Interstate 37 is set to break ground next year.